Justin Jackson carries the ball. The junior ran for 173 yards and three touchdowns against Illinois. For the final act of its regular season, Northwestern returned to a formula it often departed from this fall. Throughout their campaign, the Wildcats (6-6, 5-4 Big Ten) had tilted away from their former run-heavy identity, as the squad rode a revitalized passing attack to many of its first five wins. 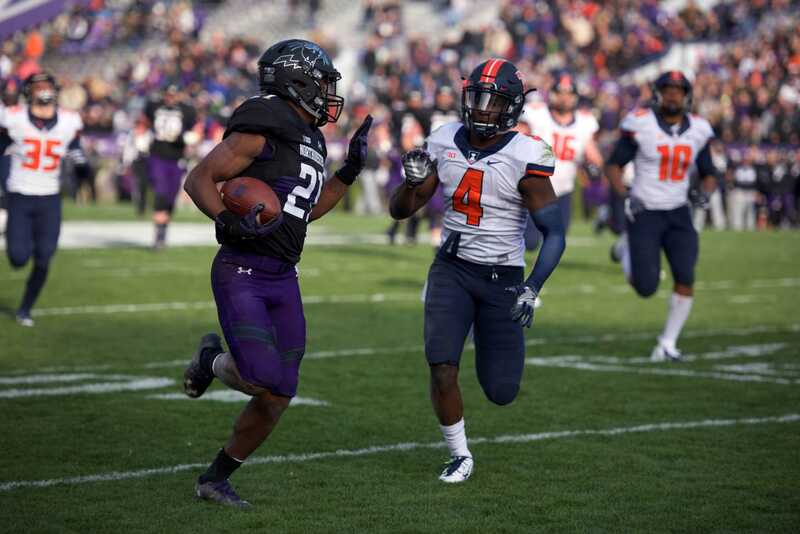 But in its sixth win, a 42-21 rout of Illinois (3-9, 2-7) on Saturday, NU stuck to smash-mouth football as it ground out 278 rushing yards and five rushing scores. Jackson led the way for the Cats, piling up 173 rushing yards and finding the end zone three times. The effort pushed the three-year starter into second in program history with 3,905 career rushing yards. Jackson also finished with his second-highest rushing total of the season, hitting triple-digit yards for the fifth time in 2016. He did it on just 21 carries, splitting time with redshirt freshman running back John Moten, and finishing with a career-high 8.2 yards per rush. Moten also had the best performance of his young career, scrambling for 128 yards on 14 carries and logging a pair of touchdowns. Moten had eclipsed 30 rushing yards just once before, as he burst onto the scene two weeks ago with a 119-rushing-yard day against Purdue. “I saw John doing well at the beginning of the game, kind of had to kick it up a bit,” Jackson joked after the game. Coach Pat Fitzgerald said the fact that NU was able to roll up yards on the ground allowed it to move away from the passing game. Sophomore quarterback Clayton Thorson threw the ball a season-low 20 times, but NU still emerged with its third highest point total of the season thanks to the play of Jackson and Moten. “We had a pretty good 1-2 punch with those two guys today,” Fitzgerald said of his two rushers. While Moten appears to be emerging as a strong backup rusher, Jackson finished the regular season with a career-high 12 rushing touchdowns on the year. He also appears well on his way to topping the program record for career rushing yards next fall.